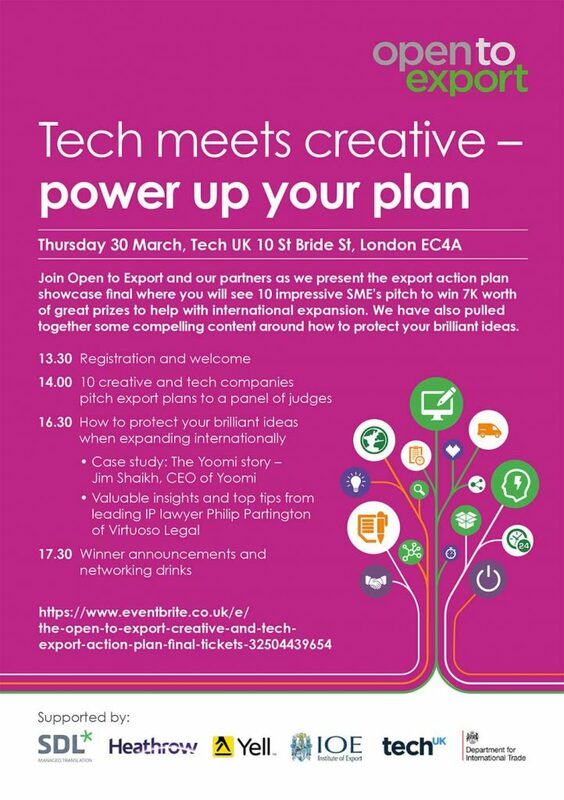 Come join us at our Export Action Plan final for the creative and tech industries at Tech UK offices in London on March 30th. The Open to Export creative and tech export action plan final will showcase 10 companies with outstanding plans to expand internationally. Each company will present their ideas and will be questioned on why they should win the £7000 worth of prizes at stake by a panel of expert judges. While the judges decide on the winner, we will hear a case study from a tech and creative company on key lessons learnt whilst pursuing international growth and a leading IP expert will share some valuable insights and top tips to help you protect your ideas. If you are a tech or creative industries small business and you would like to join us, we’d love to welcome you.